Jerusalem Artichoke also called the sunroot, sunchoke, earth apple or topinambur, is a species of sunflower native to the eastern United States, from Maine west to North Dakota, and south to northern Florida and Texas. The name "Jerusalem Artichoke" is really a misnomer. It is not an artichoke at all, but rather a tuber crop like potatoes, and has no relation to Jerusalem. 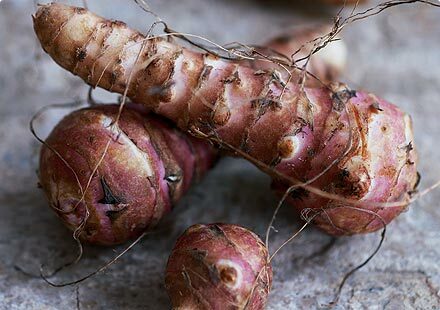 Growing Jerusalem Artichoke is VERY easy and is grown as a perennial with tubers. MAKE SURE YOU PICK A SPOT IN YOUR GARDEN OR YARD where they can get a bit out of control. They will spread if you're not careful about managing them. Stems are heavy, and grow 3 to 12 ft in height. The plant produces yellow flower heads in late August and September. 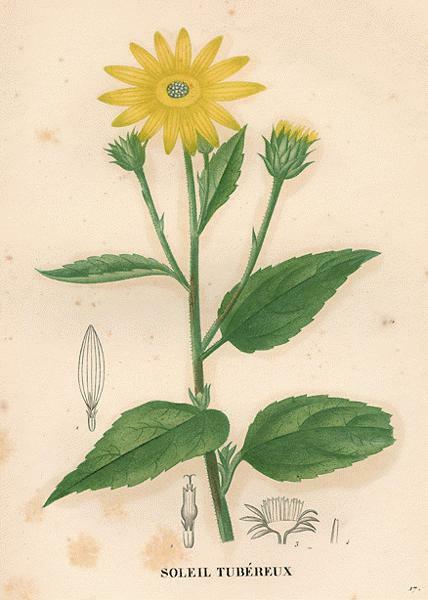 Jerusalem Artichoke is similar to water chestnuts in taste. The tubers resemble potatoes except the carbohydrates compose about 75 to 80% of the tubers are in the form of inulin not starch. Caution: They are high in inulin. The inulin is not well digested by some people, leading in some cases to flatulence and gastric pain. The tubers are prepared similar to potatoes. Plus, they can be eaten raw, made into flour, or pickled. Diseases: There's not a lot diseases that affect Jerusalem Artichoke. One that may cause problems is Sclerotinia (white mold), which causes early wilt, stalk rot and low quality tubers. . .
Insect pests:(Insect Pest Finder) Pests do not pose a serious threat.